ENDLESS FUN WITH NEW PUZZLES! 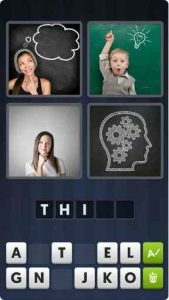 THE MOST ADDICTIVE BRAINTEASER IN THE WORLD! Challenging at times. But it must be making more creases in the gray matter. When you >>deliberately<< practice this kind of association, as you do in this app, you are doing it in a no pressure setting .. but, over time, practicing this will refine your attention to detail and hopefully improve your ability to see commonalities in things and situations that, in every day life, seem to be unassociated but actually carry a theme. This kind of skill is invaluable – in business, in life .. seeing beyond the obvious and discovering threads of commonality — or conversely, disassociating things that you have previous seen as possessing a common string. I will put a reminder in my calendar to check back in in 4 weeks and report if I have climbed some abstract mountain or conquered or refined my capabilities in these sorts of affairs. Beside, it is fun – play it together with someone – either 2 person team vs 2 person team — add a timer for an edge. Or play as a group to see who gets it right first. Or just 2 of you – plainly finding that you end up giggling at 3 am from the things you have to say about it. I love playing this game and border on addiction to it! I’ve been playing it for many, many years through at least 5 generations of smart phones. As another reviewer mentioned, I have to scrap my puzzle accomplishments and start from scratch over & over again. I find the worst part of playing to be that the system runs out of new puzzles frequently! I move along, solving puzzles and get a screen telling me there are no more puzzles at this time and I must wait for the company to make more, new puzzles! It takes seemingly forever for new puzzles to be released! Finally, I am able to download new puzzles, but once again, they run out and I have a loooong wait for them to generate more! It’s a continuously repeating cycle. I’d like to see an effort to generate a surplus of puzzles so a continuous supply is available to customers to download and play without continuously waiting in limbo for new material!